Free Flash Flv Video Converter is a powerful tool to convert flv files to other video and audio formats, such as FLV to AVI, FLV to MPEG, FLV to WMV, FLV to MP3, FLV to MP4 and FLV to 3GP. Free Flash Flv Video Converter can convert batches of FLV to most popular video files with just a few clicks. The output video files can be AVI, MPEG (MPEG1 and MPEG2), WMV (WMV7 or WMV8), MP3, MP4 (MPEG4 and H264) and 3GP (3GPP or 3GPP2). With Free Flash Flv Video Converter, you can set the output file's Video bitrate, frame size and audio channels, etc. 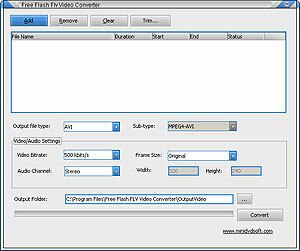 Free Flash Flv Video Converter has a built-in video splitter. You can extract only a part of source Flv file to the video format you select. With very simple settings, Free Flash Flv Video Converter can convert flv files easily and conveniently! 2) Supports convert flv to mp4 files which can be played on iPod, iPhone, PSP, PS2, Xbox and mobile phones. Doremisoft Free FLV to 3GP Converter helps you convert FLV to 3GP.